This amazing pendant looks like a piece of stone. 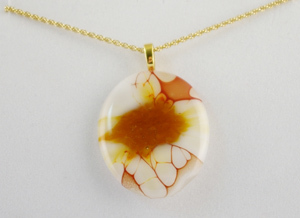 It is made by cutting a piece of white glass and a piece of clear glass into an oval and putting the two together, then piling amber crushed glass on top of a few small pieces of dichroic. It is then put in the kiln and fused at a very high temperature until the ground glass turns syrupy and makes the “veins” It is always a surprise when you can open the kiln. This process makes each piece completely unique.